Traceroute allows you to discover a network path from one host to another. Traceroute is extremely helpful examining network hops (or network devices traversed over) and information including IP Address, DNS servers, and average time taken over each hop. A popular use of traceroute is to identify network bottlenecks (poor speed performance) happening in network equipment you do not own (network equipment in the Internet). Use Terminal in Mac OS X to traceroute any network address on your local network or the Internet. Note: While traceroute attempts to explore network path hosts typically outside your private network, traceroute results always vary depending on the network hops you attempt to resolve. For instance, you may not receive replies from every device in your traceroute. Unresponsive devices are represented as 3 asterisks ***. Traceroute will always try to resolve hosts, but it can’t always. Devices that it cannot resolve are usually blocked by a firewall. 3. Terminal will send a network packet to google.com. Watch as the network packet moves out of your local network, past your ISP, and into the wild. Eventually, the traceroute will complete and it should look like something similar below. As you see, traceroute provides detailed information about a network destination. 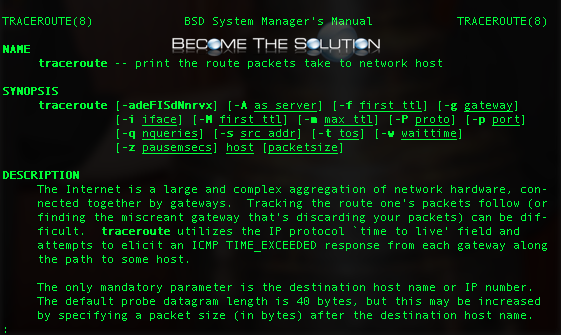 Traceroute has a variety of command options you can play with in Terminal. Take a look below. -a Turn on AS# lookups for each hop encountered. Turn on AS# lookups and use the given server instead of the default. -d Enable socket level debugging. match. By default, only one probe per hop is sent with this option. port does NOT increment with each packet sent. -F Set the "don't fragment" bit. -I Use ICMP ECHO instead of UDP datagrams. (A synonym for "-P icmp"). start with the first hop. net.inet.ip.ttl hops (the same default used for TCP connections). address-to-name lookup for each gateway found on the path). Set the number of probes per ``ttl'' to nqueries (default is three probes). -S Print a summary of how many probes were not answered for each hop. nitions. Useful values are probably `-t 16' (low delay) and `-t 8' (high throughput). -v Verbose output. Received ICMP packets other than TIME_EXCEEDED and UNREACHABLEs are listed. -w Set the time (in seconds) to wait for a response to a probe (default 5 sec.). using ICMP ECHO probes ( -I ). So they are always calculated when using ICMP. this is 500 (e.g. 1/2 second).